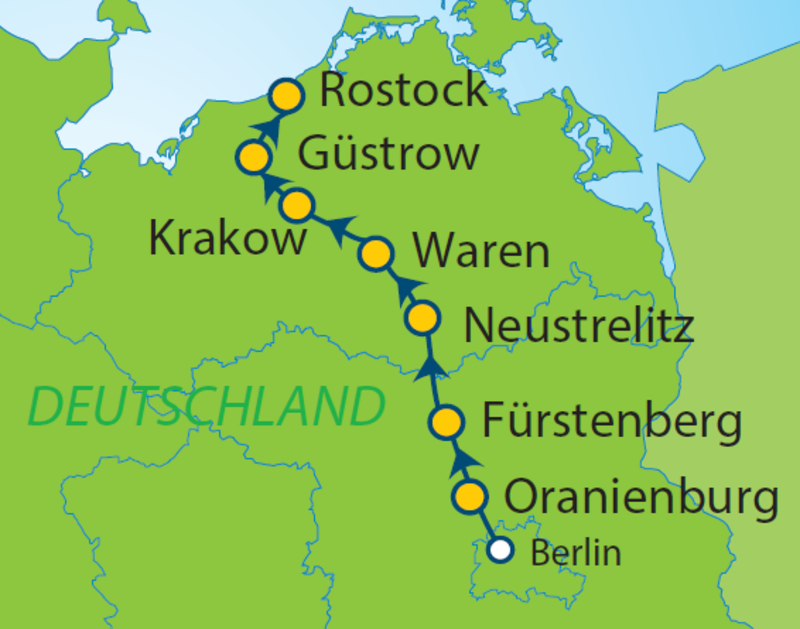 Cycle along the Oder-Havel Canal on this self-guided holiday from Berlin to Rostock. Visit Lake Stechlin, explore Heide National Park and cycle along the Butzow-Gustrow Canal to the coast in Rostock. Enjoy the beautiful landscape along the Baltic Sea Coast as you ride north along the Havel River to the Mecklenburg Lake District. Cycle at a leisurely pace along Lake Stechlin, through Neustrelitz, Müritz National Park, Waren, Krakow and Güstrow until you reach the beach at Warnemünde or Rostock. Travellers are responsible for their own transportation to Oranienburg. Take the S-Bahn connection from Berlin City Centre. Your overnight stay will be at the destination hotel. Cycle along the Oder-Havel-Canal to Liebenwalde. Continue along the Havel to Zehdenick. Overnight in Neuglobsow or Fürstenberg. A highlight of this tour is the Müritz National Park. Along the way is the small village of Ankershagen, where Schliemann, who discovered Troy, grew up. Overnight in the Waren area. In the Nossentiner Heide National Park, cycle through the vast wooded area to Krakow. Overnight in or near Krakow am See. Güstrow, renowned for the late artist, Barlach, isn’t far away. A sightseeing tour in the Old Town and in the E. Barlach Atelier is time well spent. Overnight in Güstrow. We recommend flying to Berlin region airports to reach the starting point of this cycling holiday. Arrival by car: Take the A10 / Berliner Ring - Birkenwerder exit - continue on the B96 north about 4 km to Oranienburg, after the town sign at the first traffic light, turn right in the direction of Bernau to „Saarlandstraße“, which goes into „André-Pican-Straße“ and leads to Stadthotel Oranienburg. Parking: A sufficient amount of free parking is available at the hotel (no guarantees, no reservation). Arrival by plane: (airport): • Berlin-Tegel (about 20 km away) • Berlin-Schönefeld (about 80 km away) Arrival by train: You can get to the Oranienburg station with the S1 as well as regional trains RE5 and RE12. From the station square, follow Stralsunder Straße for about 500 m, then go left on „Dr.-Heinrich-Byk-Straße“, after about 300 m, turn left on „André-Pican-Straße“ and after 250 m, you will find the Stadthotel Oranienburg on the left-hand side. Arrival by train: You can get to the Oranienburg station with the S1 as well as regional trains RE5 and RE12. From the square in front of the station, follow „Willi-Brandt-Straße“ and then cross „Luise-Henrietten-Steg“. You will reach the Hotel An der Havel after walking for about 8-10 minutes. 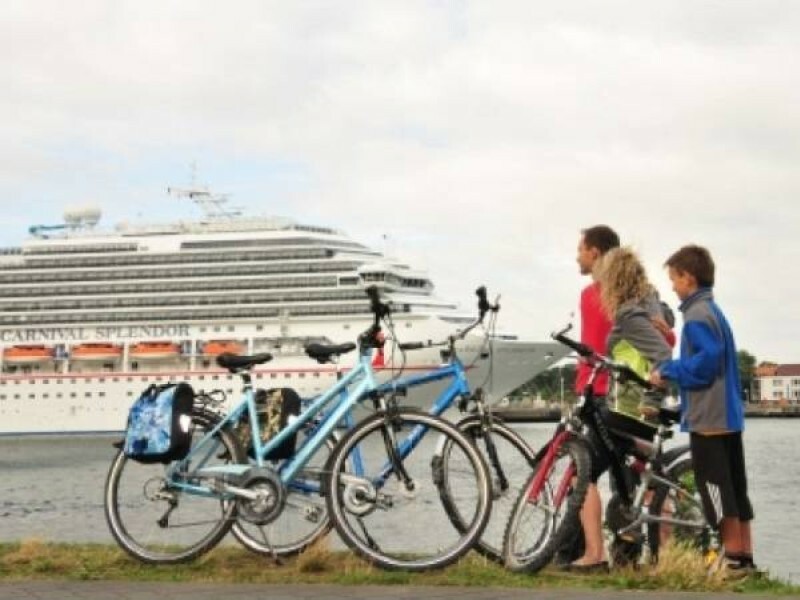 The Berlin to Rostock cycling holiday includes the daily transfer of luggage to the next hotel and local support if required.